The wheel on my mouse disintegrated, just melted into goo, I guess my fingerprints were too much for the rubber? Never realized how much I use the darn wheel. This makes 2 Microsoft keyboard/mouse combos that have not stood up very well. So I'm done with Microsoft hardware. I decided to go with a wired keyboard but still use a wireless mouse. And since no mice seem to hold up these days I went with a $20 Kensington. But I splurged on the keyboard and got a Corsair K70 rapid fire, looked like the best keyboard under $100 (after the instant $20 rebate). It has a great feel, like the old IBM keyboards I loved to type on. Cool that they give you textured keys for the WASD keys, and it lights up so no hunting for keys at night. It's going to take a little while to get used to it, I've been using a curved keyboard for several years now so my fingers are a little off when typing fast. I also got a new wireless router, just going to set that up now. Old one still works fine but they have stopped doing firmware updates for it, with all the threats out there not good to have a router that isn't being updated. Nice. I also have a corsair keyboard with cherry mx keys, but it has a bunch of extra macro keys that I'm luke warm about. I love the feel of the keys though. It took about a month to get used to, but I'll never go back to a non-mechanical keyboard. It feels much more precise, and I always know if I pressed a key or if I didn't. They are a little louder, sure, but it's not bad. I stopped using wireless mice a long time ago because I hate dealing with dead mice. I use a logitech G502 now. My favorite part about it is the scroll wheel, and how it can change modes between your normal, tactile, one tick at a time time scrolling, and a free wheeling mode where you can flick it once and it will keep spinning on bearings. It's quite useful for those incredibly long documents that take forever to scroll through, then I switch back with the press of a button for more precision control. Got my new router set up, Asus RT68U. Now I just have to decide if I want to switch this one over to the Merlin firmware. It is a bit nicer and gets updated more frequently, but the only extra feature I have ever used is the option to save traffic usage to a usb drive, not sure I care about that anymore since I rarely check it these days. Pretty sure if I change to that firmware I'll have to redo everything I just did to set up everything, so not sure it's worth the time. Other thing that I really like about the new keyboard is the volume control roller and mute button next to it. Switching to Merlin firmware on the router was less painful than I thought, didn't have to redo anything, and now I'm pretty much set up the way I was with the old router. 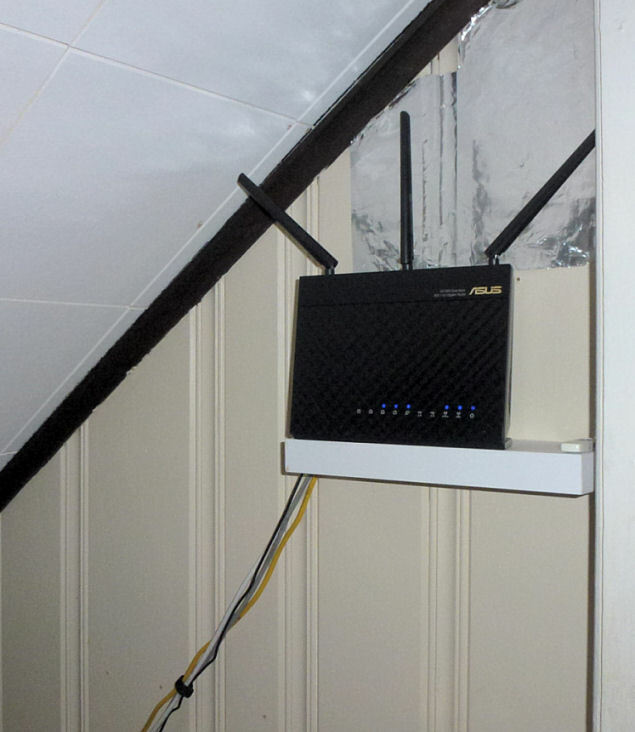 Not sure why they don't make these wall mountable anymore, I had to put a little shelf on the stairwell wall to put the new router where the old one was mounted. Well, the fan on my power supply started making odd noises when first booting up a while ago, so I knew it was time to replace it. I ordered a replacement of the same one recommended here before (CORSAIR CX Series, CX600, 600 Watt, Non-Modular Power Supply, 80+ Bronze Certified). Unfortunately, since ordering it, Amazon has three or four times said, "we need more time to get this". To me, that says that it has been discontinued. Does anyone have a suggestion for a replacement? I used every one of the connectors on the Corsair for all that I have installed, so it would have to have the same configuration. I greatly appreciate any help anyone can give, as I have still not recovered from dental crises (three cracked teeth requiring two root canals (one not done yet) and a rebuilding of a tooth (the second root canal will also require a rebuilding of that tooth). So my brain capacity has been extremely taxed (because I have not been functional enough to eat regularly, I have lost 14 pounds I should not have lost in the last 3 1/2 months, and I am fairly routinely sleeping 12 hours or more each day, with limited capacity while I am awake). The Corsair CX600 CP-9020048-US 600W Power Supply! And readers like you. Thank you. Yes, it's installed and working perfectly. And I hadn't realized just how freaking noisy the previous one was, until this got up and running. DAMN this is quiet! I am quite pleased with the lack of low-level grating/grinding noise that I guess I'd gotten used to. The fan has been noisy actually for a couple years now, it just got very noisy with intermittent stopping just a couple days ago, which was when I was able to actually locate the source of the noise, and get a replacement before the power supply itself went belly up (and, as Parker_Hylton pointed out, at that point it likely would have taken other components with it). Looks like the 600 is no longer made, so that's why they are hard to get or the prices are 2X normal. It's semi-modular, that just means you plug the individual cables (supplied) into the power supply for what you need to hook up instead of all the cables pre-wired into the supply. I was getting a bit concerned with the delays, given that the thing could potentially go out at any point in the meantime, possibly taking hardware (e.g. chip, motherboard) with it from possible surge or as things heated up. Anyone here have any experience building a computer in a 2U rackmount case and have recommendations on a cpu cooler that will fit and push air the correct direction? I may have to pick up another laptop within the next 6-8 months since the one I'm using right now is already pretty old. I'm just hoping I can get one that also has a DVD drive because I still want to play Star wars: Empire at war on my computer and AFAIK the game is only available via disc format and not available through Steam yet. i am planning on getting a custom gaming computer online because i am no good at putting things together and there is no place locally that can do it. I have always built with Intel CPUs so can't comment on the AMD chipset. Can you spring for a 1070 card instead of the 1050? No SSD? I guess it depends on what you play but load times are so much better off an SSD. with is $1450, without $1090, all about penny-pinching. That can't be just the difference for the SSD, I have a 1TB Samsung SSD and it was less than $200 over a year ago, I see them now for around $150. I have a couple 2 TB spinning disks as D and E (I think those were only $60 each several years ago). I put the OS and the games that do a lot of disk access on the SSD, everything else on D and E. It's a bit of work to set up but you can tell windows 10 to use the D drive for all your user account files (my docs, pictures, music, etc. ).